Filming does not suite me, but I think this is an interesting question worth thinking and blogging about. So here we go. The first contact with the web: During a family dinner at my uncle’s house we got a demo of “the internet”. What this meant was ~5 people looking over my uncle’s shoulder and waiting for the Hilton hotel website to load (Why Hilton?). It took about 2 minutes until a picture was loaded. I don’t remember what I was expecting, but I was not amazed by what I just saw. Not much longer after the “Hilton demo” I got an ELSA Microlink 56K modem. That changed everything. I stopped playing the clarinet, spent less time on the tennis court, but hours online. I typically avoided being around my parents at the beginning of the month, the phone bill was lying around somewhere and I did not want to get interviewed about it. I started playing around with website builders, Geocities, Tripod and many others. Most of the time I was fascinated by the amount of available under construction GIFs and many projects never surpassed the under construction phase. A book about HTML got me interested in building my first website without using a website builder. I created my first site and uploaded it via FTP to my shared hosting. I had 2MB of space available, and my startpage had over 100KB (which was a no-no back then). My first job had already “web” in its title. It was March 2000 when I started as “Web-Editor” at Microsoft Austria. For 7 hours a week, while still in my last school year. My responsibility was simple to copy and edit web pages from other Microsoft subsidiaries to local Austrian servers. Formatting content, resizing pictures, a little bit of HTML. This was the time when every agency developed its own CMS and the cloud was far away. During this first job, the discipline of “Online Marketing” was manageable. Online advertising was about banner graphics (most famous banner size 468x60px), analytics were limited to unique users and pageviews. My Elsa MicroLink modem had a big influence on my teenage years, another crucial milestone was the arrival of Web 2.0 technologies and the hype about blogs. This had an influence on my professional career. I got interested in blogging early on, it was also a huge topic at Microsoft back then and I was able to play around with lots of these new tools as part of my job. 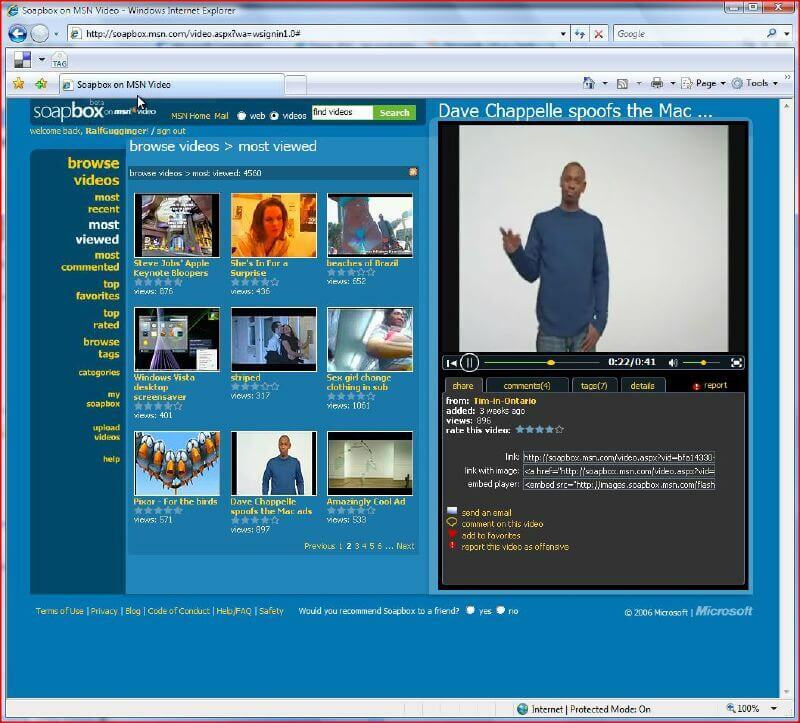 Soapbox: A competing service to YouTube back then from Microsoft in the Web 2.0 era. Not a mega-success. 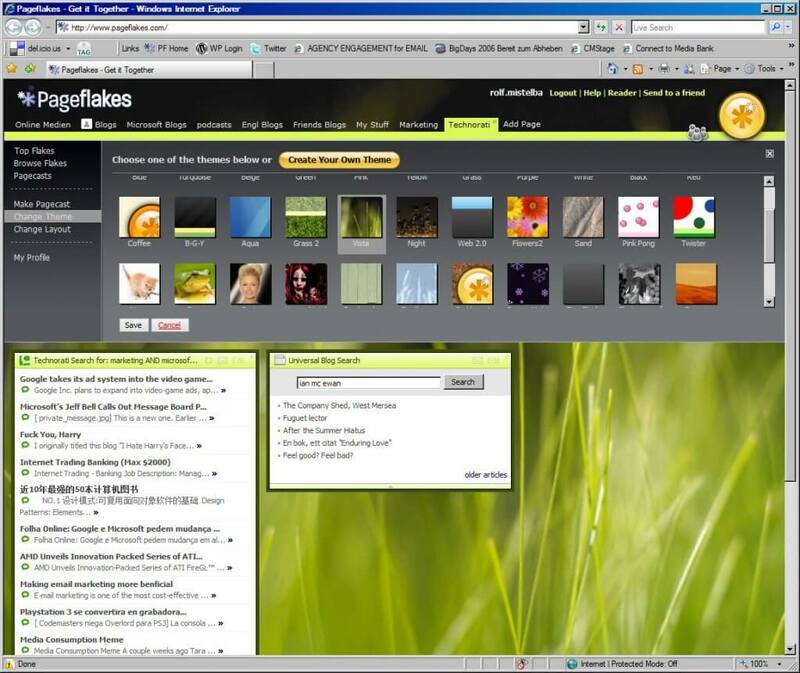 Pageflakes was a customizable start page. I loved it! There wasn’t a single week without getting a new service recommended you had to immediately check out. Even if you didn’t use it, you had to sign up and claim your username! Facebook is dominating the social media world and with that a large part of my current professional career. While countless privacy scandals have led to many outcries it has not helped any new platforms to emerge. Decentralized social networks have been a topic for a while, but it seems the tech isn’t ready for the average user. As a web professional, I spend too much time discussing advertising content, and not enough time on being creative with content. The number of resources that are spent on developing new advertising technology, and creative talent working on tactics to get users to click, that’s the part of the web where I want to spend less time in the coming years. I am not an expert on “open web”, but what I would hope for is a web where I can easily change between platforms. Recently I had to download all my data from Flickr (caused by an owner change) and uploaded it to a new cloud service. I lost all the metadata on the photos. In an ideal world, I could move data between platforms and clouds without losing data or spending hours to figure out how to do it. The example of Flickr is only one of many, try switching from Android to iOS, from Microsoft OneDrive to Dropbox, the list goes on and on. RSS was once a great way to subscribe directly to websites. It is still working but most people stopped using it. Many website owners have decided to build audiences on social media platforms instead (and with that comes a lot of junk on top of it). I am a heavy user of Feedly, but if I look around in my network most people only rely on social media to stay updated and stopped publishing on their own site completely. A positive exception is WordPress. With limited technical skills (aka no coding involved) I am able to move my content between domains, change the design, import and export content. That’s the reason why my very first WordPress post from 2006 is still online. I wish more resources going into advertising technology and social media would be spent on services with a similar mission to WordPress. WordPress published a nice video on this topic, called “A meditation on the open web“. My career started by accident with the arrival of a 56K modem in my parents home, that was 23 years ago. I am fascinated by how much the web changed since then and I am very curious about the future of the web. If you have time, I recommend to read the blog post by Sir Tim Berners-Lee. Support the Web Foundationwith a donation. I still do it. I am hopelessly addicted to claiming my username.. Thank you for writing this. I TOTALLY love it!